This year marks the 50th anniversary of the Vietnam War's longest battle, Khe Sanh. Now, pre-eminent war historian Glyn Harper has written a children's picture book that brings the impact of this conflict to life. My Grandfather's War sensitively tackles the tricky topics of PTSD, the legacy of war and the social mores that framed the return of the Vietnam Veterans. Glyn Harper, a Professor of War studies, is no stranger to untangling the complexities of conflict. A highly respected military historian, Glyn's career includes time in the military and time in the trenches teaching school children. He believes passionately that children need compelling stories to get them -hooked on history'. 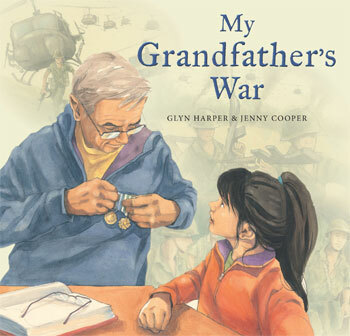 In My Grandfather's War Harper has teamed up with Jenny Cooper to create a compassionate and poignant story about a Vietnam veteran and his relationship with his granddaughter. Harper and Cooper have won awards for their work independently, as well as for their collaborations together. In their deft hands they delicately deliver the story of a child and her grandfather, a man touched by the pain of his war service. Curious to find out the cause of her grandfather's unhappiness the child innocently seeks answers, and in doing so unknowingly opens old wounds. She discovers her grandfather's sadness is a legacy of the Vietnam War and his experiences there. This is a sensitive exploration of the lingering cost of war and of the PTSD so many returned servicemen experience. Released to coincide with the 50th anniversary of the Battle of Khe Sanh (the Vietnam War's longest battle), it also sheds light on a war that is not always remembered in the same way that the world wars and other conflicts are. Many who served experience a sense of betrayal at the treatment they received on their return, as the conflict came to be regarded as the -unpopular' war, and this is covered in a child-friendly way in a note at the back of the book. Glyn Harper is a highly regarded military historian and an award-winning author of books for both children and adults. He taught English and History before joining the military, during which time he also completed his PhD, and rose to the rank of Lieutenant Colonel. Following his retirement from the military, Glyn is now Professor of War Studies and Massey Project Leader of the Centenary History of New Zealand and the First World War. Jenny Cooper is an award-winning illustrator who specialises in a realistic style. Her previous books with Glyn Harper include the internationally acclaimed Jim's Letters.